The BlackRock cordially invites to the Career Networking Reception at the Consulate General of Hungary in New York. 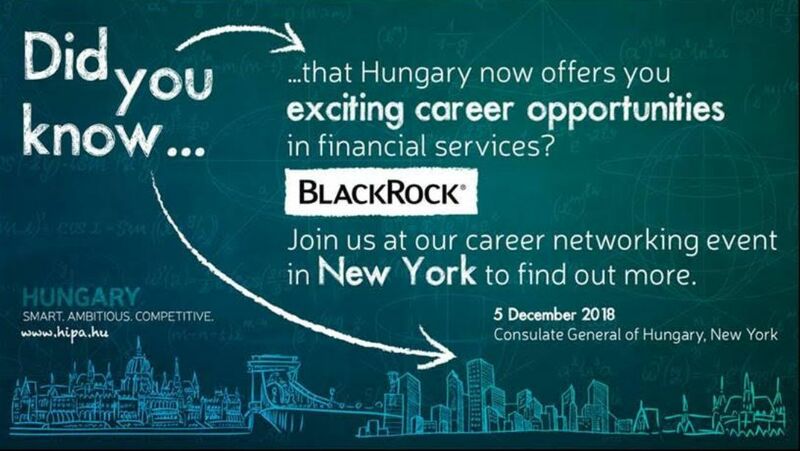 BlackRock, the world’s largest asset management company – a recent US investor setting up its innovation and technology centre in Hungary – is featuring open positions at its Budapest office, looking for young professionals returning to their home country. Join us and listen to BlackRock’s career advice and what it has to offer you. Build your future with specially selected positions at an American company’s largest office in Central Europe. Doors open at 6:00 p.m. Presentations and networking with buffet style Hungarian delicacies start at 6:20 p.m.
We kindly ask you to forward this invitation to those, may be interested.